I knew going into the month of July it would be crazy, but I had no idea just how crazy it’d actually be. 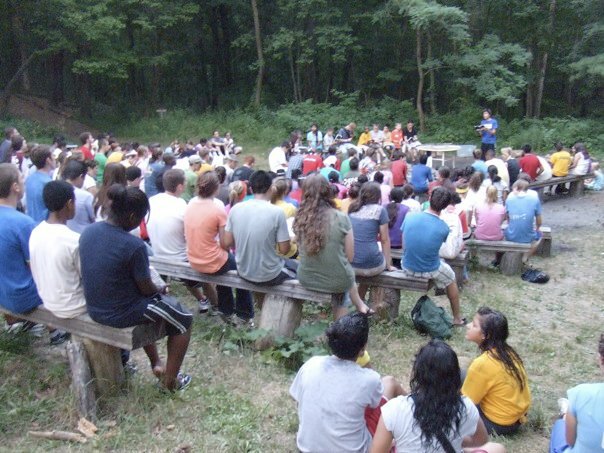 On July 4, I went to Dingman’s Ferry, PA to be a counselor at the FC Northeast Camp put on by Gardner Hall. I had never been to a camp like this before, but I decided to go and be a counselor for a week. The week turned out to be extremely productive. I was able to spend a lot of time with various people studying and teaching, and had the pleasure of baptizing one of the campers into Christ. I’m thankful that I was able to participate in the camp to encourage and be encouraged. It was much harder leaving the camp than I envisioned. But on Saturday morning July 10 we left directly from camp to go to another camp. We left around 9 am and arrived about 10 pm in Indianapolis where we were to stay the night. Thankfully, from Indy we only had about another 1.5 hours to make it to the camp in West Lafayette, Indiana. The Purdue University campus was only about 7 or 8 miles from the camp. There are several things I’ll note about this camp. 1) We slept in a chicken coup! It didn’t smell like a chicken coup, but the cabin was for sure an old chicken coup. I had talked to several people who had been to the campground before and they all left out that minor detail. It wasn’t a big deal, but I was shocked for a moment. 2) I got sick. I didn’t feel good Monday and by Monday night I was running a fever. So I slept basically all day Monday and Tuesday. Because of me getting sick, I felt like I missed out on a lot of opportunities. I didn’t know my campers the way I would’ve liked. I missed the first 2 day of classes so I was behind and semi-unmotivated to jump into all classes that I didn’t already have a good background on. Yet, it was still very beneficial for me to be at this camp. I learned some things in the classes I was in, met a lot of people in the Midwest that I didn’t know, and got to spend quality time with some old friends. When I was told we were going to be driving through the night on Friday to make it back to PA by mid morning i got EXCITED! I was ready to be back home. I was missing my bed, shower and air conditioning. But I knew it was only temporary because I leave for a camp in Alabama Saturday morning. I’m excited about this camp for a lot of reasons 1) It will be a good week of Bible study 2) I get to see some of my guys from Atlanta, and a few other teens from Atlanta 3) I get to spend the night with my parents, and see my family Saturday night. Please pray for safety in our travels, but more importantly that we can do good work for our Lord.